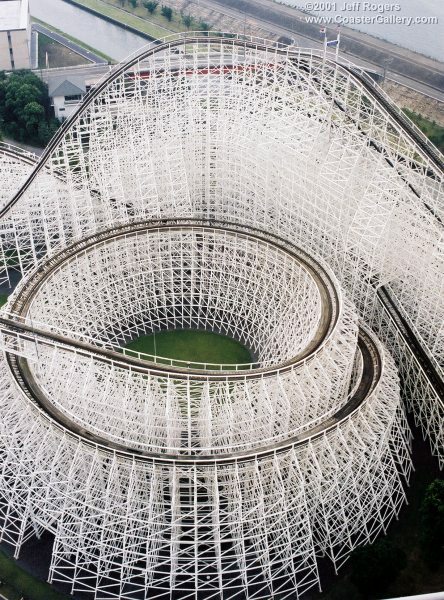 White Cyclone is a wooden roller coaster at Nagashima Spa Land in Mie Prefecture, Japan. At 1,700 m (5,600 ft) in length, White Cyclone is the third longest wooden roller coaster in the world, and is the longest wooden roller coaster outside of the United States. Despite its length, White Cyclone is still considerably shorter than the 2,479 m (8,133 ft) Steel Dragon 2000, the world's longest steel roller coaster, which is also at Nagashima Spa Land. In addition to being the third longest wooden roller coaster, White Cyclone is the seventh tallest wooden roller coaster in the world, and the fourth tallest wooden roller coaster outside the United States. A single ride on the White Cyclone costs ¥1,000, and the ride is restricted to those individuals above 1.3 metres (4 ft 3 in) in height; and those individuals under 54 years of age. Before the construction of White Cyclone in 1994, there had previously been only one wooden roller coaster ever constructed in Japan. This coaster, Jupiter, was opened in 1992—after height restrictions on wooden structures were relaxed by the Japanese government. Another wooden coaster, White Canyon, opened in 1994—the same year as White Cyclone. The roller coasters Jupiter, White Canyon, and White Cyclone remain three of only five operating wooden roller coasters in Japan, and of only fourteen operating wooden roller coasters in Asia.